My wife does some writing and a couple of months ago discovered the Bangor Literary Journal (BLJ). This is a fairly new publication – only three issues have been published, two numbered ones and a Spring special. It concentrates mainly on poetry and flash fiction (very short stories) but they also include some art and photography in the journal. I sent them a couple of images several weeks ago and then almost forgot that I’d done so. It therefore came as something of a surprise to hear that both had been accepted for publication in the second issue. One of my wife’s poems was published, too, so it was great news for both of us. The BLJ website is a work in progress – the easiest way to find issue two at the moment is via this link. Their house style fades the edge of published images to white, which I’m not particularly fond of, so I’ve posted the originals below. 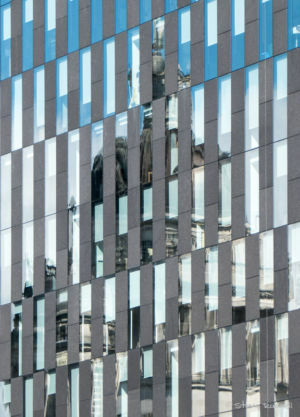 This is an image of the Port of Liverpool Building, reflected in a nearby office block. 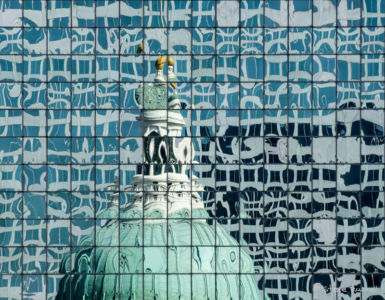 This is an image of the Old Courthouse in St. Louis, Missouri, USA, reflected in a nearby office block.